Globally recognized storyteller, designer, and entrepreneur Jonah Sachs argues that only those brands that tell "values-driven stories" through the "right" channels will revolutionize marketing and may become humanity's greatest hope for the future. He points to the example of Pixar. They are aiming to tell stories that connect with a human audience. Stories that are creative, inspired by core values that everyone can relate to, not just kids. Trying to get your message heard? Build an iconic brand? Welcome to the battlefield. The Story Wars are all around us — they are the battle to be heard in a world of noise and clamour. In our post-broadcast world, most brand and cause messages are swallowed up and forgotten before they reach the light of day. Just a few have been able to breakthrough this clutter by using the only tool that has ever moved minds and changed behaviours — great stories. Winning the Story Wars is a call to arms to build iconic brands and causes in service of a better future. And it’s an invitation to see today’s marketing challenges as an adventure through a world of wonder, danger and limitless opportunity. Since the 1950s, marketers have claimed the powerful role of mythmakers in a world out of touch with its traditional meaning stories. These marketers — legends like Stanley Resor, Edward Bernays and Leo Burnett — revolutionized society, but in the process, turned the power of myth on its head. Where once our great stories called us to adventure, higher values and citizenship, most of our current myths play on fear, insecurity and an endless need to passively consume. This story strategy had its day, but with the death of the broadcast era, audiences are seizing power back and ushering in a new, digitally empowered oral tradition. Now they don’t consume messages, they share them, make them their own and decide which live and which die. And today’s audiences are loudly demanding the kinds of stories that the human mind has always preferred — stories of uplift and empowerment. 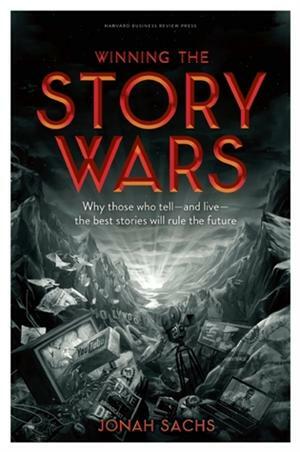 Winning the Story Wars traces the quiet supremacy of Empowerment Marketing from the early days of Volkswagen, Apple and Nike to the viral breakthroughs of Yes We Can, the Tea Party movement, The Story of Stuff and Patagonia. It offers three simple tools any brand can use to break through, earn fans and become an icon: Be Interesting, Tell the Truth and Live the Truth. With insights from mythology, advertising history, evolutionary biology, and psychology, viral storyteller and advertising expert Jonah Sachs takes you into a fascinating world of seemingly insurmountable challenges and enormous opportunity. And like the great stories that came before it, Winning the Story Wars casts you in the role of unlikely hero, full of potential to contribute something truly meaningful to the world. Jonah Sachs is an American storyteller, author, designer and entrepreneur. He is the author of Winning the Story Wars: Why Those Who Tell – and Live – the Best Stories Will Rule the Future. As the co-founder and CEO of Free Range Studios, he helps social brands and causes with campaigns built on storytelling strategies.